The search industry is one of the fastest changing industries. We need to keep up with the latest news. But have we had time to sit back and see what has happened in the past year, reflect and see what will take place for the next year. I asked a few State of Digital bloggers one question within their area of expertise. Gemma Houghton is the Marketing Director at WebCertain and has been running International Search Summit for 10 years. The first one was in 2008 and they have run over 50 in 9 different cities. “The answer is both a lot and not at all! 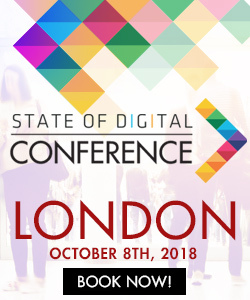 Obviously search in general has evolved a lot in 10 years, and the hot topics change with that –content marketing is something we didn’t cover in the early days but has become increasingly important, as well as topics like voice search, mobile first and featured snippets which need to be considered as part of an international strategy. However, with international SEO the fundamentals stay the same. Localising content for each market, beyond just translating text, to really speak to each audience is as crucial as ever and the challenge of scaling this to create locally relevant experiences while maintaining brand consistency remains. Geo-targeting has been on the agenda of every ISS since we started – as getting that right is at the heart of any international SEO approach – and while that area has developed over the past 10 years (think hreflang), its importance hasn’t changed. The other thing that hasn’t significantly changed is the search engine landscape. Yandex still dominates Russia, despite Google increasing its share there, mainly thanks to Android and Baidu is still the leader in Chinese search. Yandex launched in Turkey and has a small share there and Bing has increased share in some of the European markets a little, but there hasn’t been any major dent to Google’s dominance or any real shake up to the pecking order in those few markets where it can’t claim to be the search leader. Chris Green is Head of Marketing at Strategiq and he and Simon were running the hourly ranking this year and last. I wanted to ask him about rankings in KPI and if we should track rankings in 2019. The most surprising thing about the hourly ranking study was that we learned more about building a rank tracker than we did tracking rankings hourly. The rank tracking space (otherwise known as SERPs) is moving quickly and the conversations we’ve had with some major rank tracking vendors suggests that some are worried about their future. Rankings still represent traffic (when used appropriately), so higher rankings can be linked to higher traffic – but the relationship between the two isn’t guaranteed – far from it! What presents more of a problem (again, something we’ve seen in hourly), is the further we get from the “Ten Blue Links” paradigm, the less meaningful rank tracking can be. I’m not the first to say this – nor will I be the last – but the CTR relationship to the Ten Blue Links is harder to manage/measure and therefore the harder it is to equate rankings with success. There are times where there will be exceptions, rankings can be a campaign goal, but ultimately it’s a flawed metric when used in isolation. We should absolutely still be using rank tracking – hourly provided some great insights about search behavior and page issues (which I mentioned at my last SearchLDN talk #shamelessplug) – but we use it more as a tool to help us measure the impact of changes. I’m beginning to think of rank tracking to be similar as other metrics like Bounce Rate or Avg Time on Site – they’re too flawed to be your headline KPI, but they can be useful when you know what you’re looking at. The main issues which arise from rank tracking as a KPI are malformed stakeholder expectations. When someone says they want to rank page 1 position 1 for a specific term what are they asking for? Traffic, leads, revenue or the prestige for being there? Rankings are only the most suitable KPI for the last of these, leads/revenue & traffic can all be measured in far, far better ways. Irina Nica is a Digital Marketer at Hubspot Ireland. 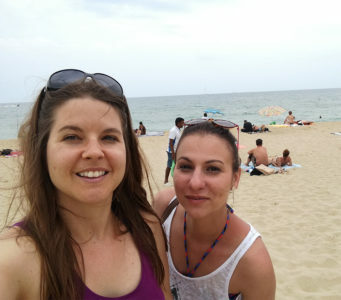 I have known Irina for 5 years (we even did some co-working in Barcelona together. 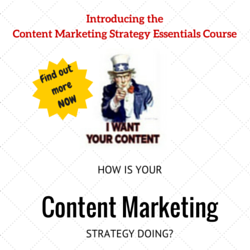 Irina has a wealth of experience which I wanted her to share about inbound marketing channels. There might be different answers to this question, for different businesses. It depends on where their potential customers spend their time, where they get their information before making a purchase decision and so on. However, we see that Search and Social are still two top channels for inbound marketers. According to our latest State of Inbound report, 61% of marketers say improving SEO and growing their organic presence is their top inbound marketing priority (Source:https://www.stateofinbound.com/). This is no surprise considering that 70-80% of search engine users are only focusing on the organic results. In order to power their SEO strategy, a lot of businesses also focus on being the best in branch when it comes to providing educational content to their readers and potential customer. Therefore, the Blog is another critical channel for driving traffic. It’s interesting to see though that Social now includes Messaging Apps. About 20% of the inbound marketers we surveyed said they want to include Messaging Apps in their Social distribution strategy next year. This is a rather small percentage compared to Youtube, but it reflects an emerging trend. Aside from focusing on driving more traffic and sales, I believe inbound marketers should also make sure they are delighting their existing customers. This has always been part of the inbound philosophy, but I think now it’s becoming the heart of it. In fact, more and more businesses have started to see that the people coming out of the bottom of their funnel have a huge impact on the people going into the top of the funnel. So, no matter the channel, the secret to growth both in traffic and sales will rely more on making customers happy. 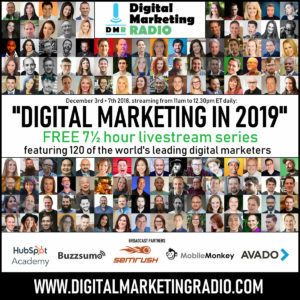 David Bain is host of Digital Marketing Radio and he is hosting “Digital Marketing in 2019” with 120 guests sharing their 2019 tips. He has grown his radio show as well as write a book on Digital Marketing. Most places where podcasters record isn’t an ideal environment for recording – there is other background noise such as the whirring fans of a computer. If you use a dynamic microphone like the Samson Q2U, this has a smaller “sweet spot”, so won’t bring in as much unintended noise. You need to make sure that your podcast is recorded at the same perceived volume as other podcasts – and that any guests that you have on are approximately the same volume as you. Pass your audio through Auphonic.com before you publish. There are certainly a lot of tips for us online marketers, tune in to David Bain’s podcast from December 3rd and get 120 free tips !